ready to become innovative thinkers and changemakers in the new digital economy. a groundbreaking program that teaches students how to become new-economy professionals who can bridge the gap between technology and business. a leader in technology strategy, digital transformation and tech-based innovation. In the new digital economy, technology is impacting every business and industry, from fresh startups to long-standing corporations. Companies must adapt and thrive, or reject change and fade into obscurity. That’s why now more than ever businesses are looking for professionals with expertise in digital technologies who are capable of uniting technology and business to generate positive results in any organisation. With this unique Dual Degree, you’ll match IE’s flagship International MBA program with an innovative offering from IE’s School of Human Sciences and Technology. Over the course of the program, students will acquire in-depth knowledge of the latest digital tools, strategy and technologies and gain, in tandem, the management and business insight needed to put these tools to practical use. At IE, we believe that business and tech innovation go hand in hand, and equip our students with the hands-on tech and management experience needed to drive innovation and transform businesses across all sectors. 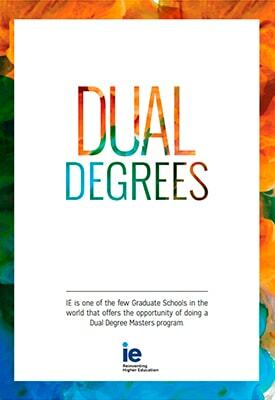 When you choose this Dual Degree, you’ll combine the rigorous academics of IE’s leading faculty with our unparalleled resources and connections. Our international community is made up of individuals from diverse academic and professional backgrounds, enabling you to broaden your perspective and improve your communication skills with sophisticated cultural intelligence. In less than two years, you’ll not only earn two degrees, but gain a unique and competitive combination of management and digital skills to transform your career. The International MBA is an official degree program. Students must fulfill the requirements listed here to be issued an Official University Degree upon its completion. The Master in Digital Business and Innovation is a University Private Degree from IE University,* taught at IE School of Human Sciences & Technology. IE has provided me with a holistic overview of today’s business, and taught me how to better understand not only the market, but also the non-market environment, as well as how to deploy different aspects of learning—such as corporate strategy, human resources and marketing—in order to build a sustainable, successful business.